I have been reading posts relating to Ancestry.com’s DNA offering (eg this one by The Genetic Genealogist) with great interest. Currently going for $99 to existing Ancestry subscribers, AncestryDNA looks like a bargain. I’m curious to see how it will tie in with member trees – the possibilities are very exciting. The DNA product is still in beta and is currently available by invitation only. I wondered if non-US residents were eligible. The DNA page doesn’t appear on the Australian site but it can be accessed from Australia here. I submitted a request for an invitation at the end of May, wondering if they would sent one to an Australian site subscriber. They did. It arrived in my email this morning. “you may not be able to use the results in a website targeted to your country of residence or hosted outside the United States”. I had assumed that the first two points would be the case. I’m not concerned about the last one as I know from experience (I checked again just now!) that I can log on, search records and view records, view member trees including my own – in fact do anything I normally do via the .com site instead of the .com.au site. The invitation is time and quantity limited. You can order one test only but if you don’t take up the offer within three days, it’s gone. Adding to the sense of urgency is a prominent countdown timer. It must have been the countdown timer that got to me. I ordered the test. No disclaimer needed. No-one gave me anything to write this and the links are not part of any affiliate scheme. I have joined Gould’s ‘Family History Through the Alphabet’ challenge. I can’t promise to participate for every letter (my track record for sticking with challenges is not good!) but I didn’t want to miss out on the fun. Here is my contribution for the letter E.
It’s so hard to find suitable ones. Great Britain. Parliament. House of Commons. Colonial Land and Emigration Commission. Twelfth general report of the Colonial Land and Emigration Commissioners, 1852. Way back in 2007 I took out a monthly subscription to Ancesty.com.au. I searched and downloaded feverishly for a month, then cancelled. The collection I hit the hardest was the Australian Electoral Rolls. Now almost five years later I have finally made my way through all those pages I downloaded and entered them in my database. My Family Historian plugin provided the final push I needed to get the job done. It made setting up the source records that little bit easier, so I could get on with concentrating on the information. I have joined Gould’s ‘Family History Through the Alphabet’ challenge. I can’t promise to participate for every letter (my track record for sticking with challenges is not good!) but I didn’t want to miss out on the fun. Here is my contribution for the letter D.
The details that give us a picture of our ancestors – her black hair just beginning to turn grey, she wore a widow’s bonnet with a black veil. The details you can use to find more information – if you can’t find a name in online newspapers, try searching for a street address. The details you overlooked the first time around – that lead to new information. It pays to revisit your (d is for.. ) documents. The details you find – at last! And you do the genea-happy-(d is for.. ) dance! The details you pick over (or don’t) – entering every scrap of information in your (d is for.. ) database, getting source citations just so. 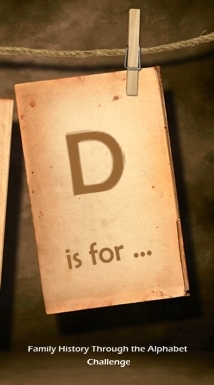 The details you would forget – if you didn’t carry a copy of your database in your preferred electronic (d is for.. ) device!